"This was not meant as a historical record, but as a dramatic account of the story, in order to evoke certain sentiments." Who wrote it, and about which topic? A) Azariah De Rossi, writing about historical stories in the Talmud, thereby earning the ire of Maharal. B) Yours truly, writing about the account of creation, thereby earning a cherem. C) Rabbi Shubert Spero, writing about the Deluge, thereby earning the ire of many. The correct answer is D) - None of the above. It's actually from an Artscroll book! The ArtScroll Kinnos is an extremely well-done and useful work. I have some pedantic quibbles about the translations of certain animals, but nevertheless, like most other people, I find that it enhances my Tishah B'Av tremendously. The translation makes the cryptic Hebrew comprehensible, and the commentary adds much useful information. I bought the softcover edition, but you can also buy a beautiful hardcover edition, which will last for many years of use! "The liturgical accounts of the martyrdom were not meant as historical records, but as dramatic accounts of the story, in order to evoke feelings of loss and repentance on the part of the congregation." For some people, this will be disturbing, and will make the kinnah less meaningful for them. Others are aware that this is a standard literary device, especially in antiquity, and will appreciate it being explicitly pointed out in the commentary. But what I find intriguing is that many people can accept the value of this literary device being used with regard to a kinnah, and yet vociferously reject the possibility of it being used in the Gemara or the Chumash. (And please, don't bring up the notion of ain mikra yotzei midei peshuto - see The Challenge Of Creation for an explanation as to why it is not relevant to this.) It would be valuable for them to contemplate and further study this literary device, and the ArtScroll commentary could serve as a good starting point. You do not have to go as far as the Kinot. NON-metaphorical interpretation of the book is wrong and should probably be banned from the bies medrish. Try suggesting that Shlomo was writing a love poem about (or to) a real live woman and see what kind of reactions you will get. If you explain that any part of Shir Hashirm is descriptive of any physical traits, you will be in big trouble. The only ligitimage view of Shir Hashirim is as a literary device. On the other hand, if you suggest that the Mabul or Gan Eden or the book of Yona are allegorical, and not literal, you will find yourself in the same situation. The question is, what is a Kinnah, Gemmorah, Torah? Kinnah is obviously poetry, nobody disputes this. The Gemmorah is mostly law. We don't find 'poetry' in law books. We do find 'example cases' You need to first prove to someobdy that the Gemmorah is poetry. Torah, again, laws, not poetry. You'd have to first prove to someone that the Torah is poetry for someone to find this understanding reasonable. 2.given that frum history dates tannaim, it would be hard to ignore the inconsistencies in this case. "in Europe according to r'ybs in many communities they discarded the kinot every year -in hopes they would not be needed the next year"
I know - that's why I wrote what I wrote! It should also be noted that in the Artscroll Yom Kippur Machzor the same disclaimer about the 10 martyrs is also noted along with explanations about how the various sages lived in different generations and therefore must have been killed separately. Listen, even in the "frum velt" there is some admission to allegory. After all, if you insist that the 10 martyrs lived at the same time you have dozens of gemaras that you now have a problem with. Nobody is arguing that the laws in the Gemarra are poetry. One might argue that certain parts of the Aggadata in the Gemarra are: "not meant as a historical record, but as a dramatic account of the story, in order to evoke certain sentiments." The Torah is not just laws - there's also a lot of narrative, especially from Bereishit till Matan Torah. No one is arguing that Bereishit and Noach are poetry, but one might argue that certain parts of these sidrot did not actually take place, but rather come to teach us important lessons. "I know - that's why I wrote what I wrote!" Could you please expand on that statement? "What ethical purpose is served by preserving a realistic historic picture? Nothing but the satisfaction of curiosity. We should tell ourselves and our children the good memories of the good people, their unshakable faith, their staunch defense of tradition, their life of truth, their impeccable honesty, their boundless charity and their great reverence for Torah and Torah sages. What is gained by pointing out their inadequacies and their contradictions? We want to be inspired by their example and learn from their experience... Rather than write the history of our forebears, every generation has to put a veil over the human failings of its elders and glorify all the rest which is great and beautiful. That means we have to do without a real history book. We can do without. We do not need realism, we need inspiration from our forefathers in order to pass it onto posterity. " Torah, again, laws, not poetry. Tanach is mostly NOT laws. It’s far more similar to epic poetry like Homer than it is to a lawbook. And some parts, like tehilim, most definitely are poetry. I don't see the connection; RSS was advocating whitewashing the "histories" of the Jewish people to uphold the honor of great people. We're talking about the idea that Torah sources invented situations for literary effect. You see this kind of "split thinking" often in the Orthodox world. The people behind Artscroll are intelligent people, and therefore find compelling the same arguments and reasoning that every other intelligent person does--unless it conflicts with a dogma of theirs. So they understand that stories in the past could have been written in a non-historical manner to cause its audience to feel a certain way--but they would never turn and apply that principle to certain other things to which it obviously applies. So: if two versions of a story appear in the gemara it's a variant recollection, but if the same phenomenon is in the Torah then the event happened twice slightly differently. Got it. I think R' Benny Lau suggested that the "Yishmael" and "Shimon Bar Yochai" are actually the *later* two people by that name, so it *might* fit. But even he says that's unlikely. Of course, if you go through all the different versions of the piyut- there are dozens- you see it can't all be historical. "Rather than write the history of our forebears, every generation has to put a veil over the human failings of its elders and glorify all the rest which is great and beautiful." 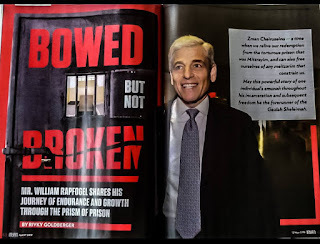 I think R' Schwab can rest assured that Artscroll is fulfilling his wishes to the max. The real question is, why not just say nothing? This is Artscrolls favored technique for dealing with hard historical questions. Believe me, at least 50% and maybe even 95% of the people who own an Artscroll Kinnos are unaware of the issue with the 10 martyrs, and they never will be aware of the issue. So why bring it up? I have my theories, but I'm curious what people will say. I object to placing the torah on the same level as midrash, much less the Arzei Ha'levanon composition. While the use of literary devices including gross exaggeration and pure fiction is common in midrash, it is inappropriate, in my opinion, to remove the torah from the category of torat emet. While the language of the torah can sometimes be figurative, one should not so blithely declare that devices used by creators of fiction are also to be found in torat Moshe. That is a religiously hazardous approach that has lead many astray. So Midrash is not Torat Emet? That seems very inappropriate and objectionable! While I certainly understand the need for human beings to use all sorts of literary devices to get their message across, it is the idea of Hashem using literary devices that disturbs me. Can we please reiterate the meaning of the concept that the Torah is written in the language of men? Are we saying that Hashem, like a talented author, is using his unparalleled understanding of language and linguistics to invoke a certain religious sentiment in his audience? Obviously we all did not get the same message, in terms of either law or philosophy. Rabbi Mattis Kantor (quoting Rabbi Yitzchak HaLevi Rabinowitz) in his book Codex Judaica in Appendex C explains how all 1o of them could have been killed at the same time. For example, he explains that it R. Shimon ben Gamlial was actually R. Shimon ben Hasgan and the abbreviation of RshBH'G was corrupted to RSHBg which led them to attribute other of the 10 deaths to different time periods. He concludes that, although not all of them were killed by the romans, they were all killed at the same period in time. That said, as Rav Slifkin quoted Artscroll, it really makes no difference whether they died at the same time or didnt. So Midrash is not Torat Emet? Why is the definition of "emet" typically reduced to historical fact or literal truth, such that if something didn't happen or is not literally true, it's not "emet"? It seems to me that an equally if not vastly more profound "emet" is that which relates to the teachings of Torah - i.e. what is Torah trying to get across to us? What is the proper path for human beings, for Am Yisrael? By that definition, Midrash, a compendium of such teachings, should qualify as "emet" even if not a single word of it carries any historical or literal truth. R' Natan, I note that you avoid giving a direct rebuttal to my contention. Of course I distinguish fundamentally between torah (as in torat Moshe) and midrash or aggadata. One is taken to be divinely crafted or authorized; the other is the work of men who have pedagogic motivations or simply like to tell tales. Kindly don't put on Hareidi airs about the veracity of midrashim. Many parts of the Torah are written in an extremely terse style and contain multiple layers of meaning. These are qualities of poetry. I don't understand why poetry and law have to be mutually exclusive with each other. 1. I believe the Netziv says that on the pasuk "write this song" that it refers to the whole Torah not just Haazinu and so the whole Torah has the din of shirah. I have seen some of the "new" parasha commentators like R. Elchanan Samet use this as a justification for literary analysis (chiastic structures and such) of Torah passages. Even though the sages were killed years (and in some cases decades) apart, they were all killed by the Romans in one era spanning many years. As such, it's viewed as one unit. In trying to understand how Klal Yisrael could have deserved such a devestating blow, the Sages understood this to be in retaliation for the sin of the sale of Yosef. Why does the fact that the 10 were killed over a long span even bring up any tough questions? Most people who responded to what I wrote mistook what I was writing. Which is my fault. Different people will view different parts of Tanach/Talmud/Midrash/Kinnot etc as poetry or not. Those which people find to be poetry will be open to 'dramatic affect' and not 'literal truth'. That which people find to be 'law' will feel the opposite. That's all I was pointing out. Which sections of Tanach are law or not is irrelevant to the conversation. For example, Artscroll obviously views Shir Hashirim as poetry and Bereshit as law. > That is a religiously hazardous approach that has lead many astray. Is this whole poetry/law imposing a distinction not intrinsic to our texts? If, therefore, there is a simple thesis expressed in this translation, it is that the bulk (though not all) of the Mishnah constitutes a work of poetry. What makes the Mishnah poetry is its severe adherence to a few stunningly simple patterns of language for the expression of a wide variety of ideas and its resort to a highly disciplined though limited syntactic repertoire for the statement of its most profound convictions. Irish Brehon law, being similarly oral in its origin is apparently also similarly poetical. I think that there are other examples in oral legal codes, but I can't be specific. The east cost earthquake today set me thinking about the passuk המביט לארץ ותרעד. Is it also a form a poetry, or did the author of this veres think that an earthquake is caused by a look of God? G*3, my objection carried the implication that belief in the veracity of the torah's narratives is an important aspect of Orthodox Judaism (however broadly defined). I agree that the descriptions of events in Gen. 1-11 should not be regarded as literally true since that leads to an open conflict with scientific knowledge. I do not agree, however, that it should be treated as pedagogic myth, i.e. a 'kashering' of popular pagan mythologies. A way must be found, in my opinion, to reinterpret the problematic language of this portion of the torah. I have endeavered to provide such a reinterpretation, but this is not the occasion to elaborate. In any case, expanding the idea that the torah makes use of literary creativity, i.e., historical fiction in other portions of the torah's narrative could call into question such seminal events as the Exodus and the theophany at Mt. Sinai. If one questions those traditions, then there is little basis for accepting any tradition other than loyalty to traditional Jewish practices, i.e., Orthopraxy. Why would GOD (or Moshe) use such a problematic device? If, however, the torah is not regarded as a divinely crafted work (or at least divinely authorized), then it loses its position as the fundamental text of Judaism. While such an approach may not perturb those who don't identify as Orthodox, it should perturb those who do. I think the issue here is not necessarily one of poetry versus law, but rather context and traditional interpretation. For centuries, the most educated Jews believed that Bereishis contained a basically factual account of creation and the flood. To say that nowadays, based on knowledge derived external to the tradition, we must re-interpret the traditional texts, is troubling. It gives the impression that the tradition was lacking, if not downright misleading. This is especially true since nothing in the text indicates an allegorical or poetic account. The creation and flood narratives are presented seamlessly along side the presumably factual narratives of the Patriarchs. It is therefore a much bigger stretch to treat those allegorically. But for a kinnah, the most educated Jew always knew that the kinnah was more poetry than history, since it is clear from within the tradition itself that the kinnah cannot be historically accurate. This is especially true given the context of the kinnah, a poetic elegy recited on a day of mourning. Given such a context, it is reasonable to say that kinnah is ahistorical, while still maintaining that the context and traditional interpretation of Bereishis proves that Bereishes is historical. So trying to present this as some type of doublethink on the part of Chareidim is not at all accurate.
" This is especially true since nothing in the text indicates an allegorical or poetic account." The Torah and Midrashim, give no explanation as to why Snakes can no longer talk to people or tell them why they should eat certain fruits. Except for those midrashim which read the Torah allegorically. Losing the power of speech was not one of the snake's curses. btw, I was searching the net for some explanation of why snakes no longer talk (to see if anyone held this way in a historically accurate fashion) and came across this blog post, which I think makes some very good points about 'Bias' and arguments which are basically based on mockery. While I appreciate what you and others have to say on the topic, it is important to remember that Masekhet Hagigah in the Bavli has some negative things to say about those who take the story of Bereishit literally. I'm sorry I don't have the page and reference handy, but if I remember correctly it says at one point that whoever does so is either a fool or a heretic! I may have the words wrong and anyone who has the reference would be appreciated (or correct me if I have misstated!). However, even if this is a reference to mystical interpretations concerning Ma'aseh Bereishit (scholars would know far more than me) it is important to remember that anti-literal interpretations are already present and accepted by the Gemara. "R. Nieto seems to hold that the Asra Harugei Malchus died during the same time frame (p. 64). This difficult historical riddle has been dealt with by many just to list some sources see Erchei Tanaim Vamorim, (Blau Ed.) vol. 2, pp. 708-15; S. Kraus in his series of articles in Hasholach 1925 (recently reprinted in Mered Bar Kochchba, pp. 239-76) and the recent book on the topic by E. Vilnar, Asreh Harugei Malchus printed by Mossad Rav Kook.